Happy New Year 2006!! , It's the second day of the year, and already rain is falling around the island. MDNA&A Radar image is showing some rain clouds approaching the islands, the rain shall begin tonight and will continue true the morning tomorrow. The skies are totally covered with clouds, and humidity is around 80% temperature is in the 25C, finally some rain since that very dry December!! light to moderate shower that's it for the week. 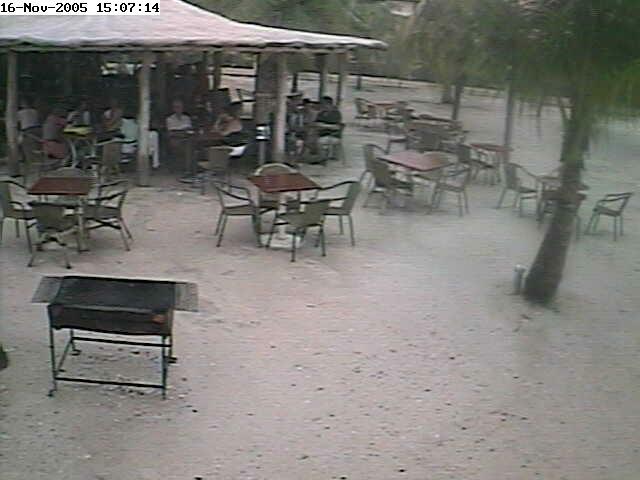 Right now Bonaire is still getting the rain as consequence of T.D. 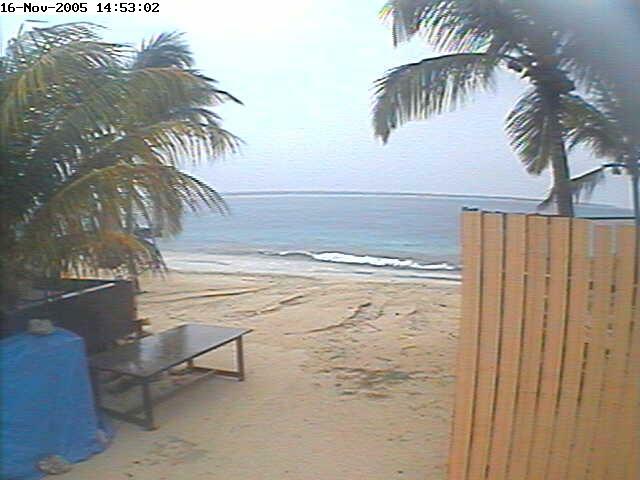 27 passing north of the ABC Islands as you can see on the BONAIRECAM everybody is still inside and the beach is deserted. The radar shows the sky hasn't clear a bit over Bonaire from early morning , a personal weather station on wunderground.com collaborates this scenario. Yep, like I said in my previous post about T.D. 27 heavy rain fell on Aruba, although not as much as I expected, 51mm of rain from 6am to 8am some roads according to METEO the heaviest was on the north section of Aurba. The "Dam di Rooi Afo" was breached and roads were closed. 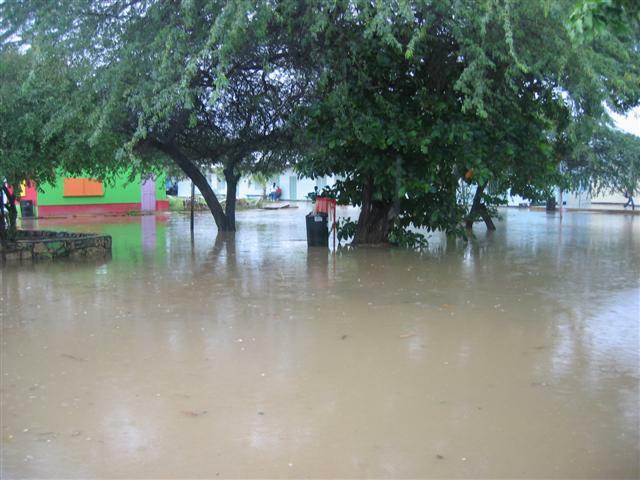 The Valero Gas station is still under water, Colegio Arubano a local High School was flooded again and students got a RAIN DAY!!! Rain with lightning and thunder began at 1am till 6am, followed by so medium rain showers that lasted 2 hours, Traffic is pain in the neck right now, The calamity prevention office and DOW are now in a meeting doing "Damage Control" The forecast is rain, rain rain (by the way you can see that on the radar pic) The folks on CURACAO and BONAIRE received most of the rain accordingly to the MDNA&A Radar Image and Satellite Pictures of NOAA. I'll post again in the afternoon or sooner if something happens. - T.D. 27 Almost GONE! So, T.D. 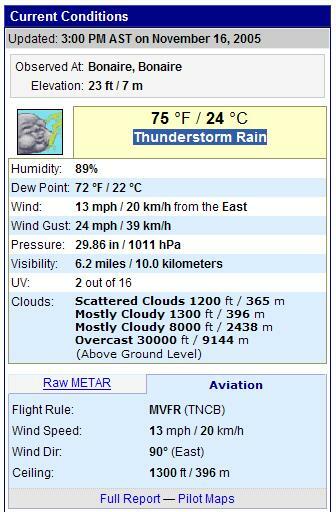 27 has almost dissipated according to the latest NHC Advisory of course there is still a heavy rain treat for the ABC Islands, but with a weak depression that is a lot smaller. 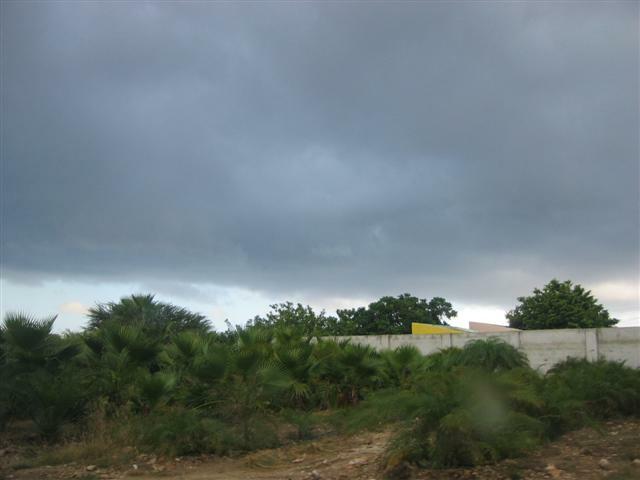 Right now in Aruba the skies are cloudy I see some Cumulonimbus Clouds and lightning on the far east of the horizon, Today not a lot of rain in Oranjestad, but it was very cloudy day indeed.On Monday in Curacao it rained more than on Aruba and Bonaire was dry like a desert. 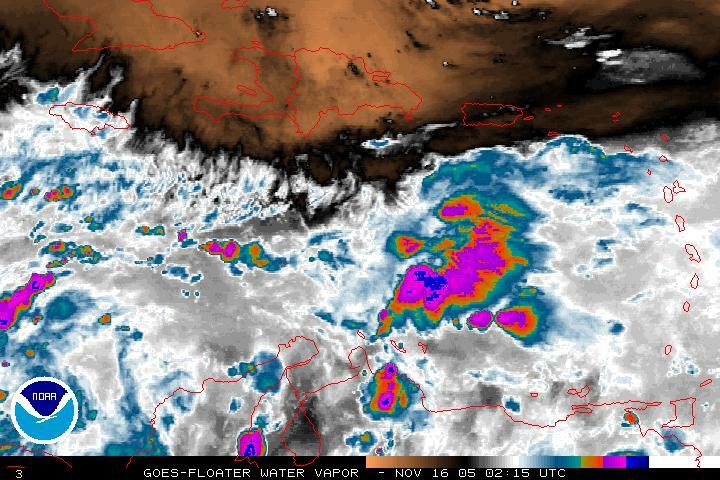 FAVORABLE FOR DEVELOPMENT IN ANOTHER DAY OR TWO. T.D. 27 is now clearly visible on radar. Vapor Image of T.D. 27 shows it's almost GONE! 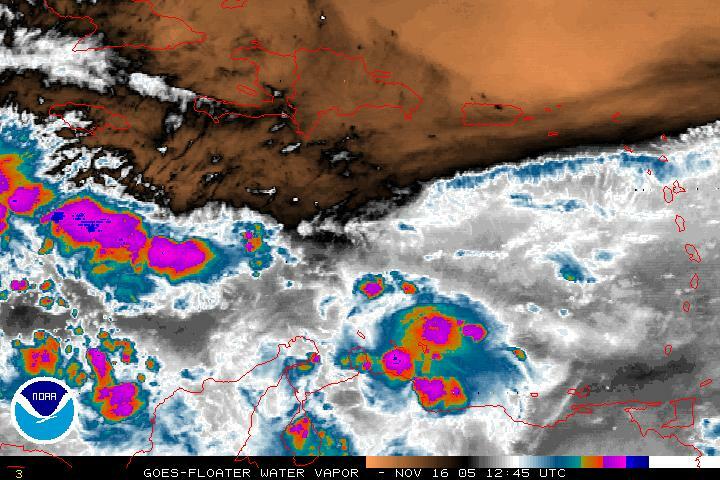 The latest Vapor Image is showing that the deepest convection (Thunderstorms, Rain, Wind,) is located well south of Tropical Depression 27. Well, another tropical disturbance is menacing the Windward Islands with heavy rain, gusty winds and possible landslides, the NHC is keeping an eye on this disturbance. The satellite images early today were spooky, but now the disturbance has lost some power. Some models are taking this storm to the south, yep for the ABC Islands, and I really don't like that!!! Today it has been quite a rainy day it started at 4am and it's still raining right now, the cable when out of service for 30 minutes, also some radio stations when out as thunder began to rumble my windows. The sky is gray, the temperature is 25c, Everybody is crazy about tonight's concert of Carlos Vives although the promoters are saying the show will go on no mater what. While most of the islanders will be dancing in the rain, I will stay home keeping an eye on the tropical disturbance. 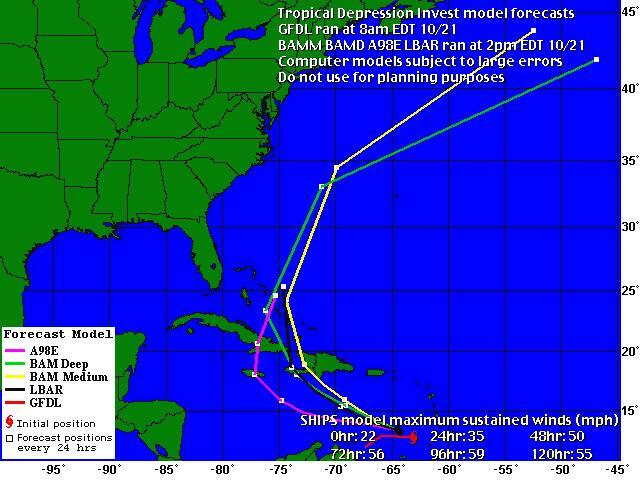 Second run models are not optimistic for the ABC-Islands, but remember they can be WRONG! 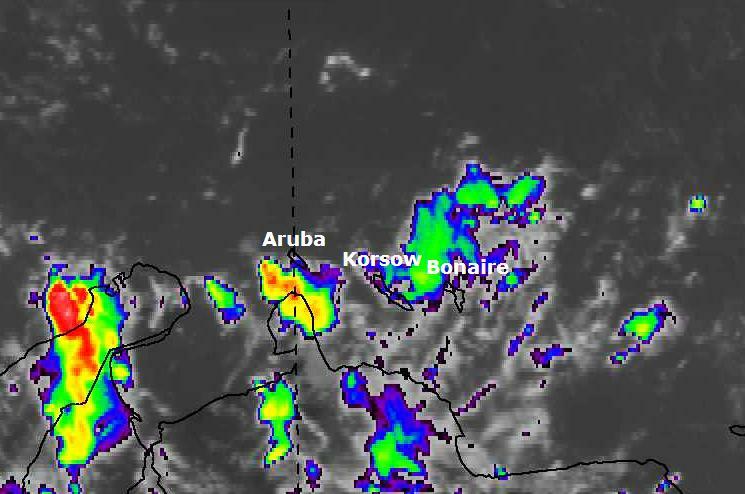 IR-Image of the region showing activity near ABC-Islands and the Tropical Disturbance near Barbados. 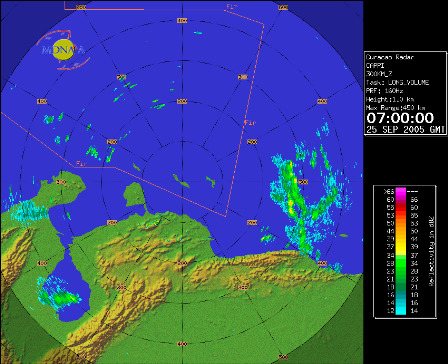 Vapor-Image of the region showing activity near ABC-Islands and the Tropical Disturbance near Barbados. It's almost November and our raining season is knocking the door, Heavy Rain Showers fell this afternoon for like 30 minutes in Aruba. I also heard thunder far far away no lightning, the weather will stay so until end December, heavy rain and then sun shine and vice-versa. In this active hurricane season we only had Hurricane Emily which passes 190km north of Aruba, only some localized flooding, but for the rest it was OK! We're still hopping that nothing more comes to our region, but recently, there is some activity brewing close to us, lots of tropical wave, causing rain and very dark skies, and at night illuminating lets hope they don't organize too much and become tropical cyclones. - Bad weather by Alpha? no gusty winds, just thunder.... and as usual not much rain only a nice lightning display. 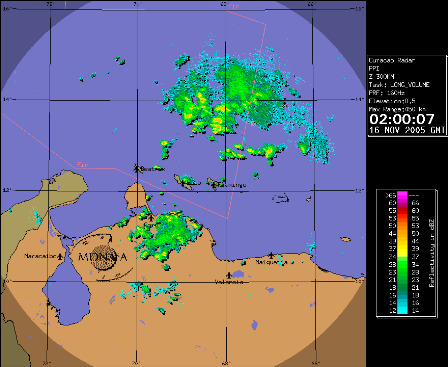 COULD BECOME A TROPICAL DEPRESSION WITHIN THE NEXT COUPLE OF DAYS. It' flashing right now here in Aruba, I have lost powered must of my neighbors also, it's has been raining heavy for an hour right now. 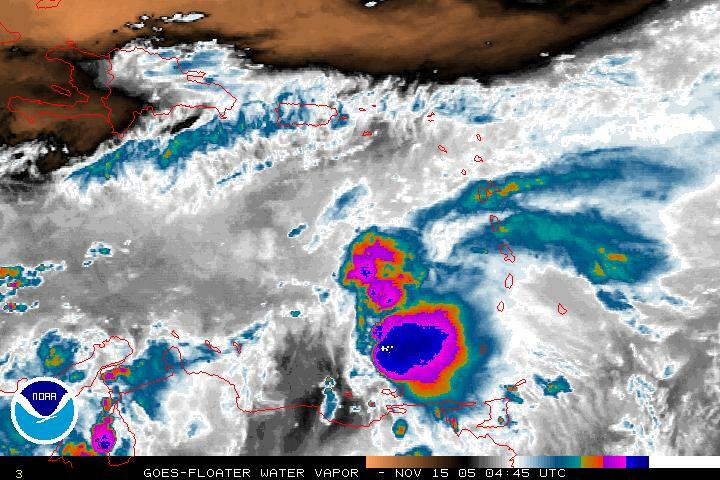 NHC finaly says something about the convection north of Aruba. The sky in Aruba is totally cloudy, thunder and lightning began at 3am and ended quickly at 4am, until now not a drop of rain. HAS DEVELOPED AND WHICH MAY DEVELOP MORE AS THE DAY GOES ON. AND 60W JUST EAST OF THE CARIBBEAN SEA ISLANDS. 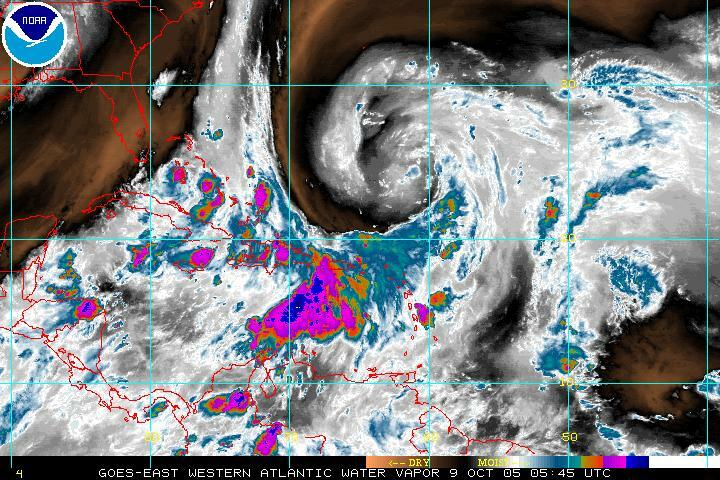 There is an incredible amount of convection (thunderstorms) between Aruba and Puerto Rico. 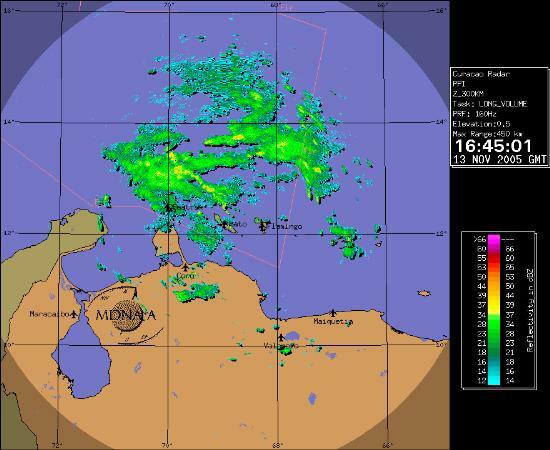 A "Noisy" Thunderstorm cause some loss of power in certain small parts of the islands, but was not a heavy rain maker. but still it remembered us all that the 2005 hurricane season is not over. 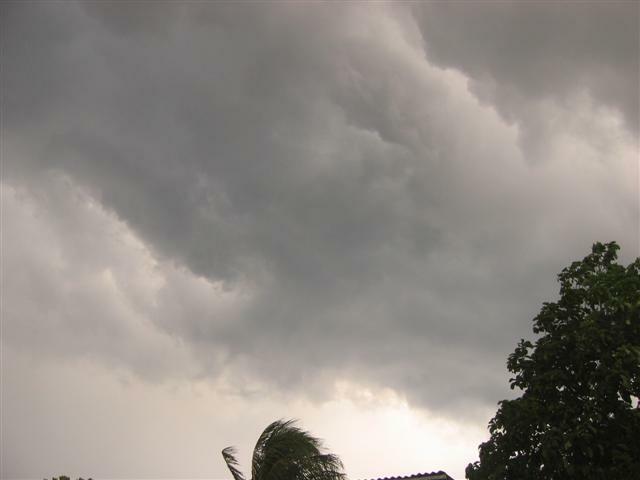 The storm was caused by a high altitude disturbance in the atmosphere that is generating clouds to develop enhancing at the same time the chance of rain or thunder near the island. Also 7 of 12 Radio Stations went out of service for hours and the mail server of SETAR (Local Telecom Company) was also down, unknown if the lightning cause damage or they suffered a power failure. 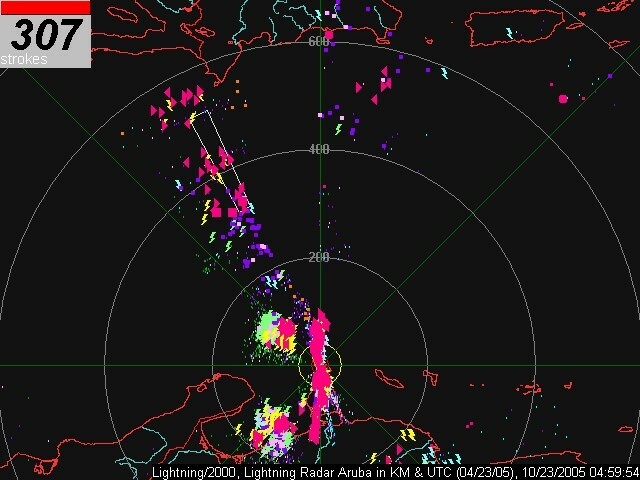 Above: Lightning Strikes measured by a BOLTEK radar located at the Airport. OBSERVATIONS...AND UPPER AIR DATA FROM TRINIDAD AND GUADELOUPE. will be influencing the local weather during this forecast period. These systems will still induce cloudiness over the area. the islands during this forecast period. A Tropical Wave is nearing the ABC-Islands. 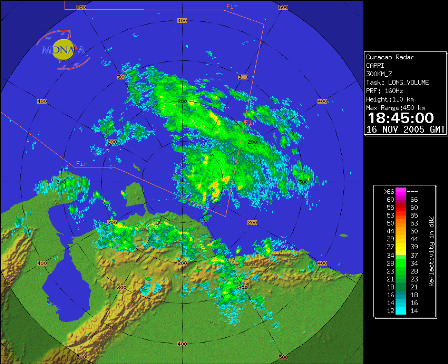 The CUR-MET Radar indicates moderate rainfall approaching . It looks that Tropical Storm Philippe will miss us totally, but we hope the best for St. Marten, St. Eustatius and Saba. The Tropical Wave Close to the windward islands is getting more organized, some models have it going close to Trinidad other close to St Marten I will keep you posted of any news. Lots of sun, some clouds from time to time if your here in Aruba you may want to try The Hurricane Simulator at R.E. Irasquin and Sons made by "Bibi Arends" of the Crisis Management Office of Aruba. Also visit the expo which I helped putting in together for Mr. Arends some great tips there! R.E. Irasquin is the local car dealer for Mitsubishi located at L.G. 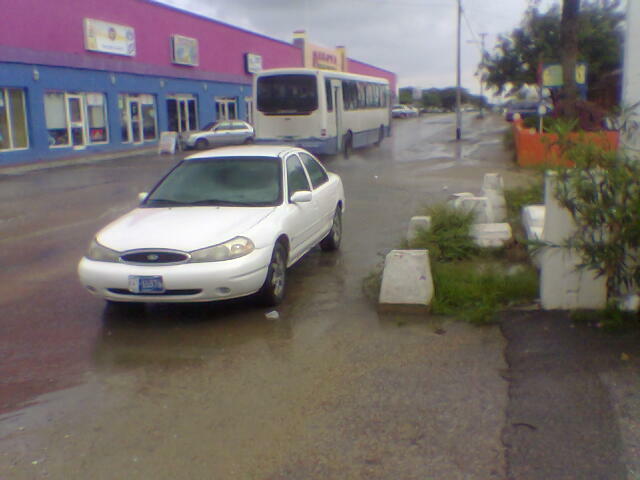 Smith Blvd infront of the Aruban Port Authority. 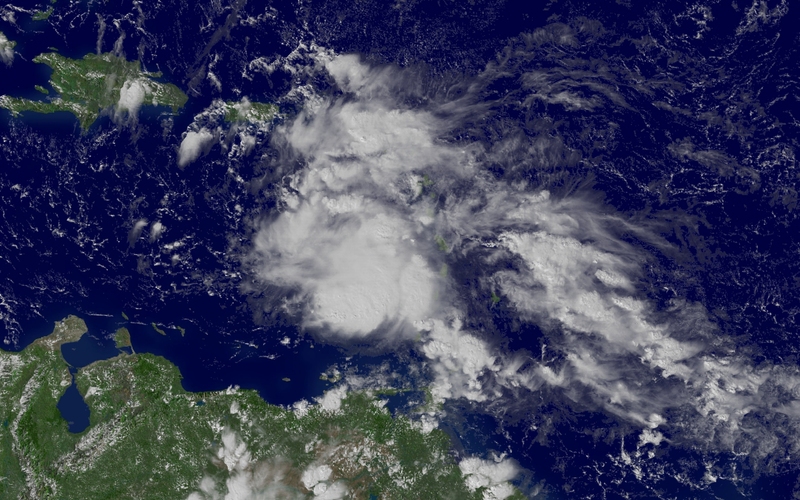 TD 9 has posses no longer a treat to the ABC-Islands, so bye bye TD9/Irene. T.D. Nine and maybe Irene in the coming days is now in the deep tropics it's a little north of where Ivan and Emily formed. I'll keep track of that storm as it continues to move westward as forecasted. Well, if you belief only rain can fall of the skies in this 2005 hurricane season think again!! A big "cloud" of Sahara dust is approaching the Caribbean sea, we can expect a nice sunrise and sunset today because particles will reflect more light causing the sun to be more reddish. It's more than 24 hours that Hurricane Emily moved north of us at a distance of 190km. The official rain report indicates a total of 39.4mm of rain, with Ivan it was a total of 250mm of rain. Some houses were flooded for a small period of time, the damage was very low. Wind was not a problem, there weren't a lot of trees down if any, The long waited "Tale of Emily" (feeder bands) or in papiamento "Rabo di Horcan" didn't reach us and did not cause anything but a light breeze in the early morning. 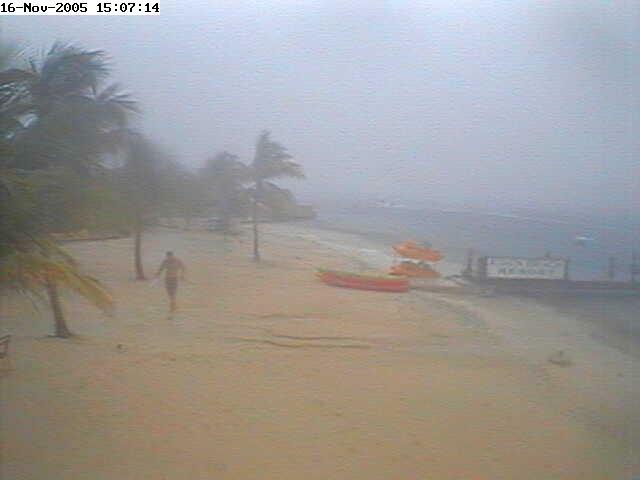 Please visit www.sciencearuba.com for a special report of the passage of Hurricane Emily. Well it has been a very long week for me, I would like to thank all of those who reacted to my reports of Hurricane Emily. I wish the people who are in the path of the storm specially those in Jamaica and The Cayman Islands very good luck. Well it's now sunny and the effects of Emily are now over, the sky are clearing up by the minutes, there is now even sunshine. Some houses were flooded according to a local radio station at San Nicolaas and Zeewijk that's located on the south eastern side of the island. 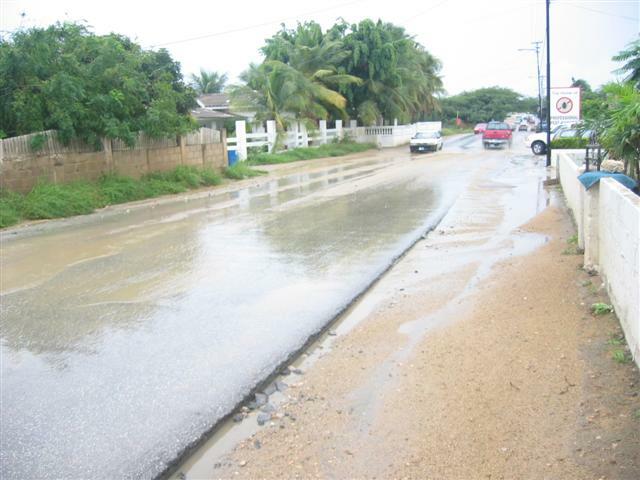 Heavy rains are reported around Aruba, some houses are flooded, Roads in Yucuri, Zeewijk, Emanstraat, L.G. Smith Boulevard, Pos Chikito and Savaneta are closed because they are now rivers.Until now it's has been raining for 2:30 hours, There are periods of heavy rainfall and some periods of normal rainfall i must say the rain is still less than what we saw with Ivan.. The skies are now totally grey and CUR-MET Radar Images indicates that the clouds are full of rain. thunder has now started as I'm writing this report. The sky is mostly cloudy, the air is kind of humid, there is almost no wind it's very very calm, everything looks normal. This afternoon we had clear skies comparing to what we saw in the morning, winds were calm and it was a Little bit colder than yesterday. The waterspout was a false report, some people mistaken a low altitude passing clouds with funnel cloud according to drs. Marck Oduber. People here are really not in a hurry to prepare, I must say almost no one has prepared for this storm, The local calamity prevention office says it has started to give order to all EMS services to stand by. There is no plywood on the windows, there isn't any people buying desperately some batteries and can food. It is just a normal day here in Aruba. There are unconfirmed reports of waterspout touching ground near the local airport south east of Oranjestad. Far west outerbands of hurricane Emily reaching Aruba right now, the sky is getting darker by the hour, there is almost no wind and until now no rain has fallen on Oranjestad, When Ivan pass it was a lot less darker than now I must say, until now there has not been any press conference of the government, only weather bulletins of the local Met. Office or from the NOAA. The 5AM Advisory of NOAA about Hurricane Emily, says that the Hurricane has started to move west-northwest, something very good for Aruba. This means that Aruba will receive less rain, and weaker Tropical Storm winds, still no official word if a Tropical Storm Warning will be issued. Now, this hurricane season was full of surprises, I hope that Emily doesn't bring a nasty one to us. Want to learn more about Tropical Cyclones and how the Aruban government respond to these threats? 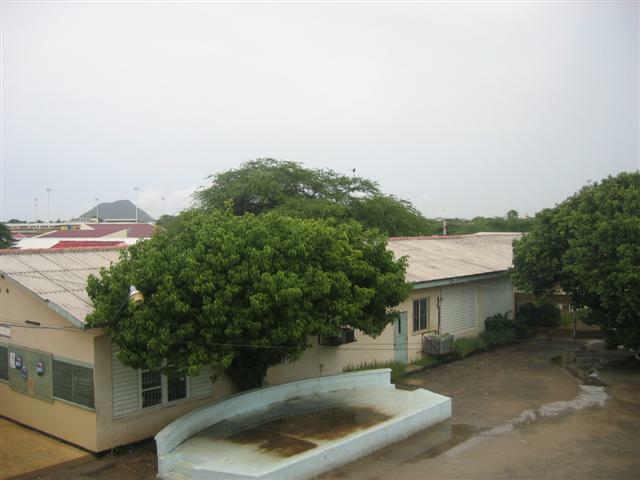 Than take a look at the lectures of Aruba's weatherman drs. Marck Oduber and the director of Calamity Prevention Bibi Arends. Just go to www.sciencearuba.com for free videos and learn the truth of Tropical Cyclones passing close of Aruba. - EMILY IS NOW A HURRICANE! Tropical Storm Emily has developed into a Category 1 hurricane when passing north of Tobago. It is expected that tomorrow a Tropical Storm Warning will be issued for the ABC-Islands. As you may have read in the latest NOAA Advisory about Emily, The whole North coast of Venezuela is under Tropical Storm Warning. Local media reports that tomorrow around 5am a hurricane warning/watch may be issued by the local Met. Office - Just like what happened with Ivan. NOAA also forecast that 3 to 6 inches of rain may fall, tomorrow will be Judgement day for Aruba. Let's hope it passes a little bit North from us. If conditions continue to be the same, A Tropical Storm Warning will be issued tomorrow, it's predicted to pass Aruba 180KM on Friday morning as a Category One Hurricane. All the local radios are now sending a special bulletin, a radio stations calls Emily "Hurricane Ivan Part II"
The Weather is the typical Caribbean Weather, lot's of sun and some light breeze. Aruba has got some direct hits of Weak Tropical Storms, Emily is a Severe Tropical Storm, the possibility of a direct hit cannot be ruled out according to Aruba's only meteorologist yet. - Where is the wind again! Woke this morning to cloudy skies and a light drizzle- looked at the map and I hope this does not develop. The good news- when the winds are this light, the snorkeling is perfect! Well not even June 1 and the weather is very strange. This is the second day in a row with thunder, grey skies and variable light wind. I hope this is not an indications of what is to follow this year. So far no real rain to speak of- just enough to make the roads slippery. I hope those of you who are getting more rain are ok and don't have too many problems. Let's hope Adrian dies out soon.